Well, CNN stepped on a rake again. Last week, they totally botched a story about Donald Trump, his son, and his inner circle receiving an email from Michael Erickson that contained a decryption key to a trove of Wikileaks emails from John Podesta and the DNC. The insinuation was that these documents weren’t public when in fact, they were. They also got the dates wrong. Getting dates wrong is what landed ABC News’ Brian Ross in hot water when he reported earlier this month that Trump had directed Michael Flynn to make contact with the Russians during the 2016 campaign. It was actually after Donald Trump had won the election. Setting up a diplomatic framework is not an unusual move for an incoming administration. Ross was suspended for a month for this report. It's just sloppiness from the mainstream liberal news media that seems incapable of reporting on this White House accurately. Sessions initially listed a year's worth of meetings with foreign officials on the security clearance form, according to Justice Department spokeswoman Sarah Isgur Flores. But she says he and his staff were then told by an FBI employee who assisted in filling out the form, known as the SF-86, that he didn't need to list dozens of meetings with foreign ambassadors that happened in his capacity as a senator. 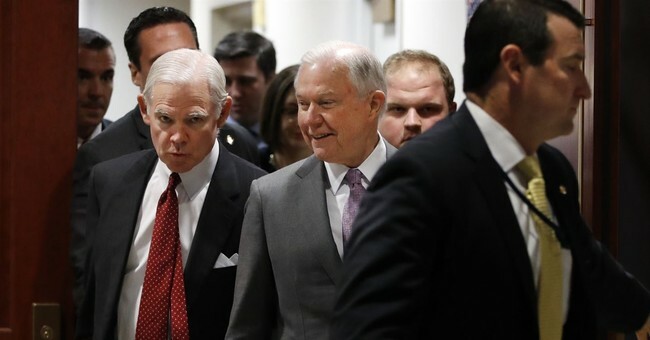 A newly released document shows that the FBI told an aide to Attorney General Jeff Sessions that Sessions wasn't required to disclose foreign contactsthat occurred in the course of carrying out his government duties when he was a senator. The FBI email from March bolsters the explanation by the Justice Department for why Sessions didn't disclose contacts with the Russian ambassador in his application for a US security clearance. When the omission of the foreign contacts on the form was first reported by CNN in May, the Justice Department said Sessions' office was advised by the FBI that he didn't need to disclose the meetings. An FBI agent, whose name isn't made public in the document released by the bureau, was responding in March to a query from Sessions' assistant. The assistant sought confirmation of what she said was an earlier conversation on the matter. At the time, news of Sessions' Russian contacts had recently become public and prompted fierce political criticism. The agent didn't recall the earlier conversation but affirmed that "he was not required to list foreign government contacts while in official government business unless he developed personal relationships from such contacts." So, CNN actually knew this back in May, which is that Sessions didn’t need to disclose such contacts during his time in the U.S. Senate, but decided to make the insinuation anyway that the attorney general was hiding something because keeping Russian collusion theater going is good for ratings. Regardless, the damage is done. ABC News, BuzzFeed, Politico, Huffington Post, and The Washington Post were off to the races with this non-story, but worked wonders among the Left to keep the whole Russia collusion-Manchurian Candidate theory alive and well. The media’s obsession with Trump and Russia is becoming a rather embarrassing spectacle, fraught with mistakes and bogus reports. To this day, there is still zero evidence that proves the Trump campaign colluded with the Russians during the 2016 election. Maybe because no such evidence exists. As for the media, well, can you guess why no one really trusts them anymore.